I'll make sushi for "YOU." 1. I realized that bad sermon at the new year's eve was not caused by the preparation of Sushi, but by the lack of preparation of sermon. 2. I realized that making Sushi was really a piece of cake. 3. I felt like I was lazy when I did not prepare Sushi for the service. 4. I want "YOU" to come to enjoy the service, not only the Buddhist service, but also Japanese foods! 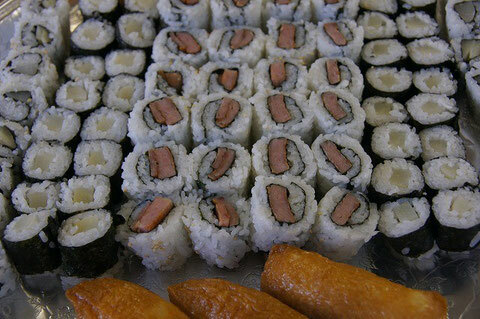 So once again, I"m going to make Sushi for "YOU"...next time... on Sunday, February 24, 2012 at 10:30 a.m. It's for "YOU." I always look forward to seeing "YOU" here at Koloa Jodo Mission.